We offer single and double (two person) kayak rentals. Our kayaks are great for two adults and a child. 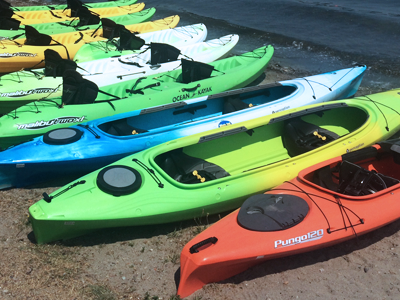 We offer a variety of kayaks - sit-on-tops are the most popular: easy to get in and out! We supply the paddles, PFD's for all rentals, and, of course, instruction. Come and see the WhatsSup crew at Bothell Landing & Log Boom Park in Kenmore! As an added bonus, canoes and beach cruiser bikes are also available. We do not prorate. We are a walk up rental. Must be 18+ to rent. Prices do not include sales tax. Major credit cards welcome. Visa, Mastercard & Discover. Don't know how to use a Kayak? No problem! All kayak rentals come with basic instruction!